Hamilton Accies defenders Mark McLaughlin and Brian Easton have scooped the monthly player prizes in the Scottish Football League awards. Both were outstanding as Accies finished top of Division One this season to clinch promotion to the Scottish Premier League. 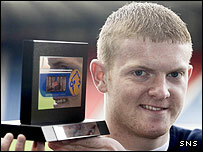 The 32-year-old McLaughlin, who joined Accies from Clyde in 2004, was named player of the month by sponsor Irn Bru. Easton, 20, was chosen as young player of the month for April.